XIII. (7) JUSTIN SHERMAN II, son of Eli and Polly (Phelps) Sherman; born Oct. 3, 1791, at New Milford, Ct.; died Dec. 17, 1841, at New Milford; married Sept. 25, 1814, at the home of Wanzer Marsh in New Milford. Phoebe Main, dau. of David and Lucy (Edwards) Main, who was born Jan. 9, 1796, at South Kent, Ct., and died Feb. 9, 1865 at New Milford. 1. Lavinia Ann, b. June 24, 1816; d, Feb. 29, 1904, m. Isaac Brock Bostwick. ii. Eli, b. Mch. 4, 1818; d. Oct. 31, 1893; m. 1. Lois Northrop, 2. Maria Northrop. iil. Lucy Adeline, b. Apr. 23, 1820; d. Jan. 7, 1908; m. Eli E. Wordin. iv. Henry David, b. Oct. 8, 1824; d. Jan. 28, 1917; m. 1. Sarah Jane Tompkins; 2. Sarah Elizabeth Secrest. v. Emmons Hawley, b. Apr. 4, 1828; d. Apr. 28, 1912; m. Susan P. Osborne. vi. Julia Maria, b. Jan. 9, 1831; d. May 21, 1897; m. Timothy Mansfield. vii. Polly Orinda, b. Oct. 23, 1835; d. Apr. 9, 1898; m. Alonzo Parcells. viii. Orcelia, b. Sept. 20, 1837; d, Jan 21, 1918, m. Rollin Chebar Emmons. ix. Rachel Jane, b. July 17, 1840; d. m. David Atwater Baldwin. Orcutt's Hist. of New Milford, p. 765, speaks of Justin Sherman II as being "of Merryall". Merryall is a part of New Milford. Orcutt also gives the marriage of Justin and Phoebe Main, Sept. 14, 1814, at New Milford, in the home of Wanzer and Sally (Bulkley) Marsh. At the time Eli and Polly (Phelps) Sherman moved to Fairfield, Vermont, their second son, Justin II was a boy about sixteen years old already earning his own living in New Milford by farm labor, work in a flour mill, and work in a marble quarry. He did not accompany his family to Vermont but remained in New Milford living in the home of Mr. Wanzer Marsh and employed by him. Justin was drowned while on an errand of mercy. The winter of 1841-42 was unusually severe. There were people in poverty and distress living just across the Housatonic River from the Sherman family. Poor as he himself was, Justin contributed what supplies he could, gathered more from his neighbors, loaded a sled and took help to the destitute ones. As he was returning from this trip. Dec. 17, 1841, the ice on the river broke, he fell through and was drowned. Phoebe (Main) Sherman was the granddaughter of John Main, Jr. and his wife, Hannah. Her father, David Main, was born Aug. 16, 1771. John Main, Jr. was a soldier in the Revolutionary War. Ibid., Series 2, Vol. VI, Doc. 115. 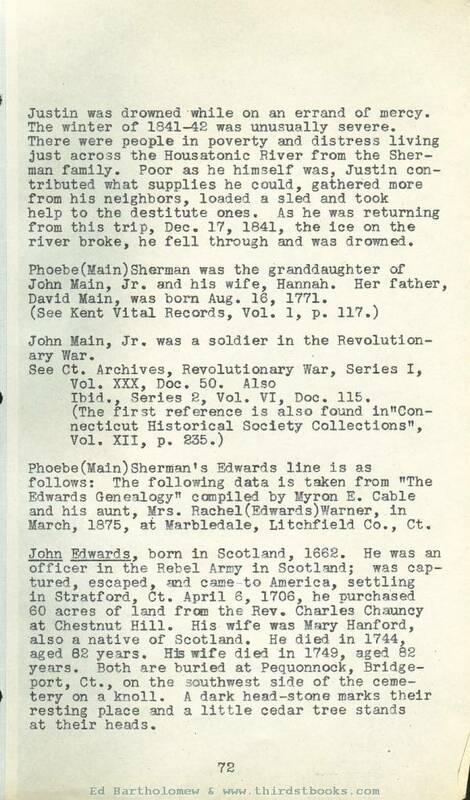 Phoebe (Main) Sherman‘s Edwards line is as follows: The following data is taken from "The Edwards Genealogy" compiled by Myron E. Cable and his aunt, Mrs. Rachel (Edwards) Warner, in March, 1875, at Marbledale, Litchfield Co., Ct.
John Edwards, born in Scotland, 1662. He was an officer in the Rebel Army in Scotland; was captured, escaped, and came to America, settling in Stratford, Ct. April 6, 1706, he purchased 60 acres of land from the Rev, Charles Chauncy at Chestnut Hill. His wife was Mary Hanford, also a native of Scotland. He died in 1744, aged 82 years. His wife died in 1749, aged 82 years. Both are buried at Pequonnock, Bridgeport, Ct., on the southwest side of the cemetery on a knoll. A dark head-stone marks their resting place and a little cedar tree stands at their heads. Joseph Edwards, married Prudence Wakely, 1741. Abel Edwards, b. Stratford, Ct., 1753; d. Apr. 5, 1826, New Milford, Ct.; m. 1. Lucy Hawley, 2. Sarah Mann. Lucy Edwards, bapt. Oct. 18, 1772, d. Apr. 28, 1828; m. David Main, bapt. July 26, 1772, d. about 1810. Phoebe Main, who married Justin Sherman. Lucy (Edwards) Main remarried after the death of David Main, a man named Emmons. She moved to Cornwall, Ct. where she died and is buried. 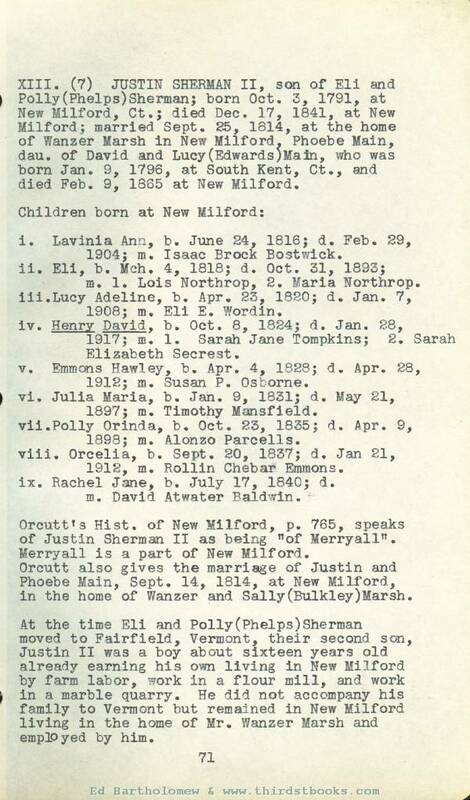 Baptismal records of Abel Edwards' children are found in the Parish Register of St. Paul's Church, Huntington, Ct., p. 37. Abel Edwards was an American soldier in the Revolutionary War. "A company of militia in the Revolution that went to Ticonderoga, fifth Regiment, second Company, commanded by Lt. Col. Samuel Whiting, of Stratford, commencing June 26, 1775, and ending Nov. 29, returns for back pay". Abel Edwards' name is given in list of privates. 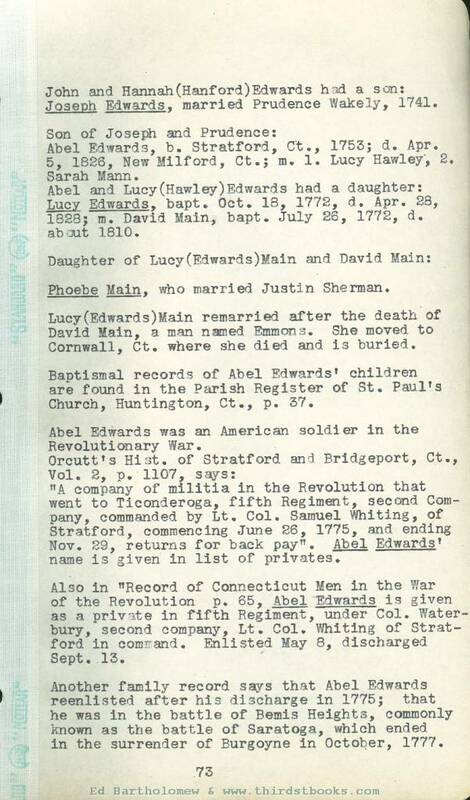 Also in "Record of Connecticut Men in the War of the Revolution p. 65, Abel Edwards is given as a private in fifth Regiment, under Col. Waterbury, second company, Lt. Col. Whiting of Stratford in command. Enlisted May 8, discharged Sept. 13. Another family record says that Abel Edwards reenlisted after his discharge in 1775; that he was in the battle of Bemis Heights, commonly known as the battle of Saratoga, which ended in the surrender of Burgoyne in October, 1777. He was wounded in this battle on the 16 or 17 of September, 1777, by a sabre in the hands of a British dragoon. Both Isaac Brock Bostwick (1814-189S) and Jotham Sherman (1768-1859) who knew Abel Edwards well testified to the scar on Abel’s upper lip that was the result of this wound. XIV. 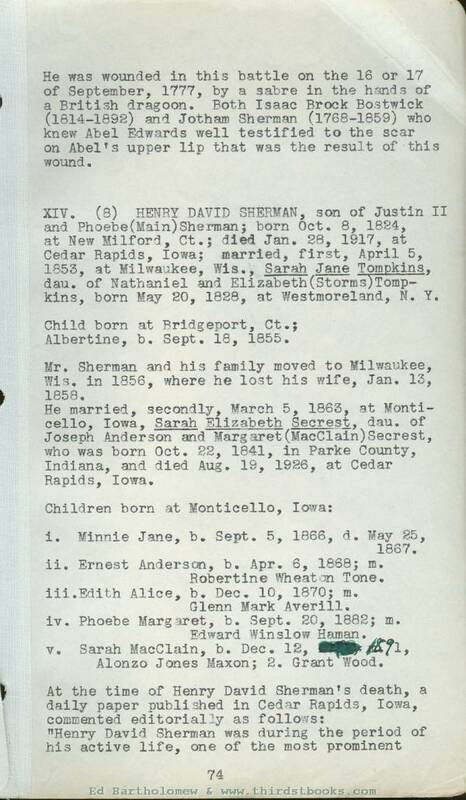 (8) HENRY DAVID SHERMAN, son of Justin II and Phoebe (Main) Sherman, born Oct. 8, 1824, at New Milford, Ct.; died Jan. 28, 1917, at Cedar Rapids, Iowa; married, first, April 5, 1853, at Milwaukee, Wis., Sarah Jane Tompkins. dau. of Nathaniel and Elizabeth (Storms) Tompkins, born May 20, 1828, at Westmoreland, N. Y.
Albertine, b, Sept. 18, 1855. 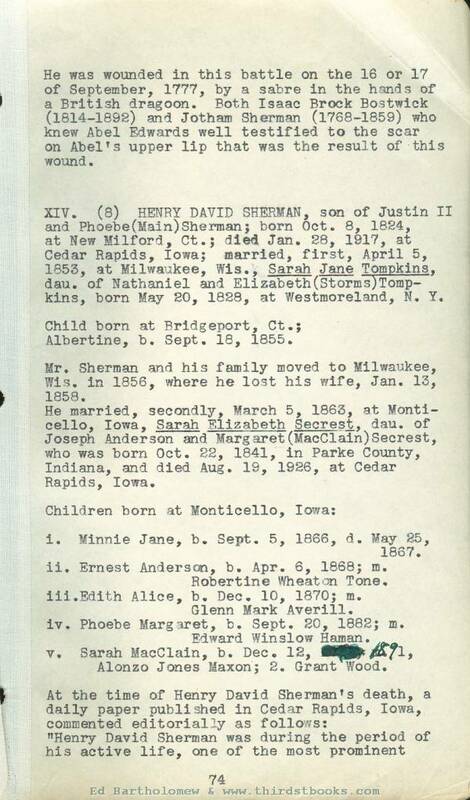 Mr. Sherman and his family moved to Milwaukee, Wis. in 1856, where he lost his wife, Jan. 13, 1858. He married, secondly, March 5, 1863, at Monticello, Iowa, Sarah Elizabeth Secrest, dau. of Joseph Anderson and Margaret (MacClain) Secrest, who was born Oct. 22, 1841, in Parke County, Indiana, and died Aug. 19, 1926, at Cedar Rapids, Iowa. i. Minnie Jane, b. Sept. 5, 1666, d. May 25, 1867.
ii. Ernest Anderson, b. Apr. 6, 1868; m. Robertine Wheaton Tone. iii. Edith Alice, b. Dec. 10, 1870; m. Glenn Mark Averill. iv. Phoebe Margaret, b. Sept. 20, 188S; m. Edward Winslow Haman. v. Sarah MacClain, b. Dec. 12, 189(1), m. 1, Alonzo Jones Maxon; 2. Grant Wood. (reseacher note: this is Sara's copy of her sister's book. Sara blotted out her birthdate ... 1883 ... and changed it to ... 189(1) .... The 1900 C shows her born Dec 1883 and 16 years old. She did the same date change on page 82. Just a guess... in 1935 Sara married Grant Wood born 1891. She would have been nearly 52 years old to his 44 years. men In the state. He distinguished himself as an educator, and later, he evolved the idea of dairying by way of the creamerv which afterward developed into a great business and so richly profited Iowa. He was the creator of the first creamery of the type to have a separate building in town to which farmers brought their cream to be churned and made up into a marketable product. It did away with the drudgery of churning on farms and made a business of what had been a haphazard sideline with the farmers. What the butter product of the state and nation now amounts to is beyond comprehension in dollars. The men who laid the foundation of such business are entitled to honor and Mr. Sherman was the foremost man among these. The butter product of his own creameries repeatedly took the highest prizes in national competitions. Mr. Sherman was personally responsible for the passage of the law that gave Iowa a State Dairy Commissioner, and he was for four years under Governor William Larrabee, the first to hold that office. An unostentatious man he was in his office at the State House; one always on duty and always loyal to the service of the public. He came of fine American stock of English origin. He was born a Connecticut Yankee. From "boyhood he had to make his own way, and in the thirties of the last century - he was born in 1824 - it was not so easy to do that as it is now. The boy who secured an education by his own efforts had to pay the price in hard work to which the modern boy is an utter stranger. 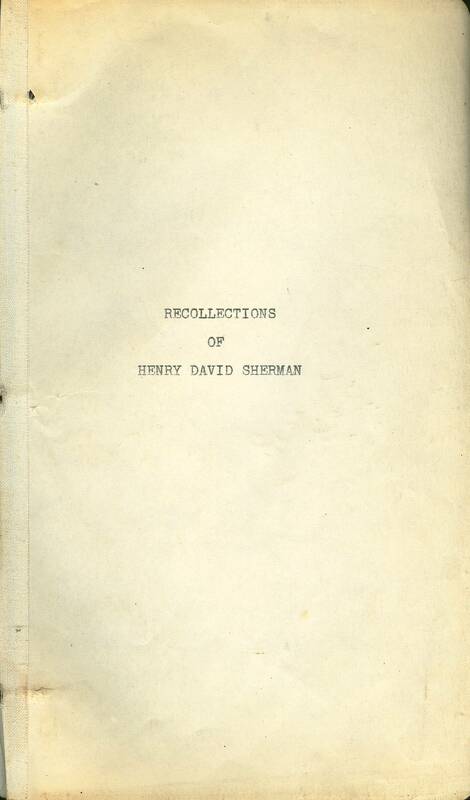 Mr. Sherman finished his education at the State Normal School in New Britain, Connecticut, when he was twenty-eight years old. He came to Iowa In 1859 after several years of High School teaching in New Milford and Bridgeport, Connecticut. He settled in Monticello where he was highly esteemed and where besides his success in public school work, he held all the civic offices that man bestows on his fellow man because of confidence in him, and because of his worth to the community.